This is Part 2 of 3. Click for Part 1 and Part 3. How fast can you go on a skateboard? This is a question that skaters have been trying to answer since someone ripped the handle off a box scooter and pointed it down a hill. Regular followers of this blog will be familiar with Pete Connolly’s need for speed. 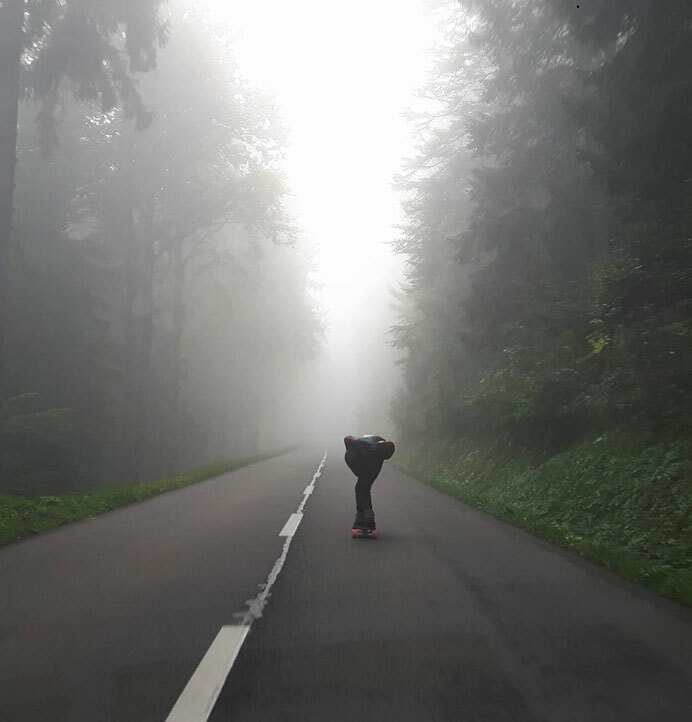 But as anyone who regularly gets close to their own limits will know, to really push for top speed requires a scientific approach as well as just pointing your board down the hill and sending it. Warming up for this year’s L’Ultime Descente, Pete recently took a trip to Switzerland to try and find out exactly what it takes to make fast, even faster. “Speed is a black art. What works for one person, doesn’t always work for the next. Tuck aside, there are significant gains to make with your equipment, but what actually works? If you want to put theory aside and find some facts, you need to have a different approach to your skating. 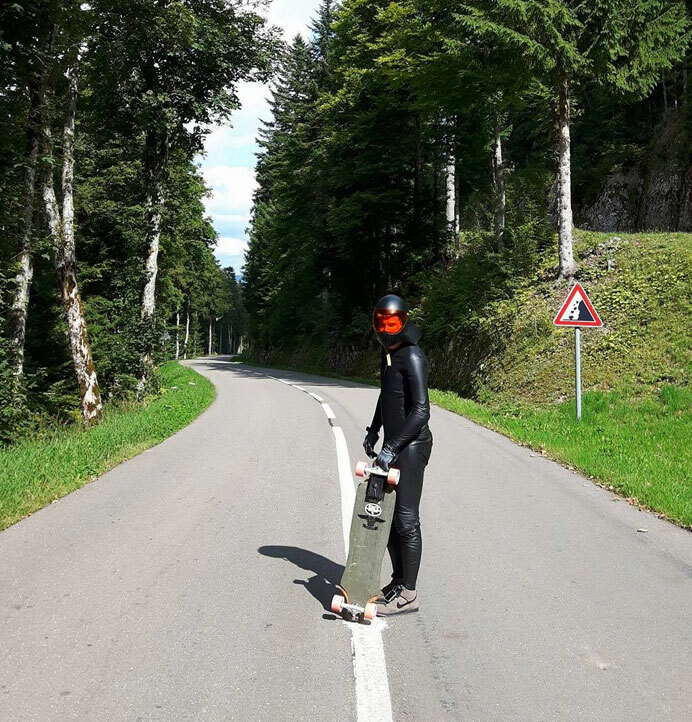 Forget about freeriding with your buddies and doing slides, it’s time for some serious robot skating, and where better to hone your precision than Switzerland. 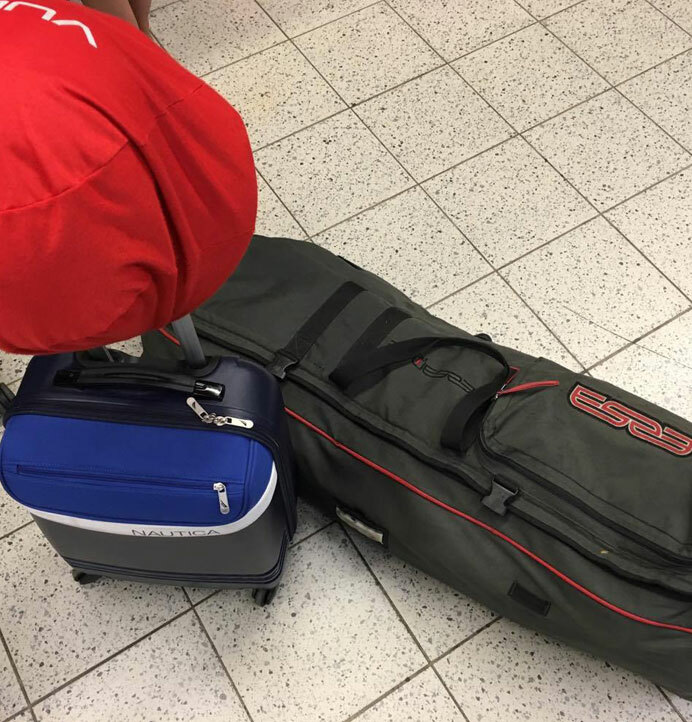 This race bag has done more miles than yours. My friend Damien Andrey, a Swiss DH legend who has been bombing hills since the early HotHeels events, picked me up at Geneva airport for a weekend of training. We headed to his home area of Neuchatel where he was my guide. 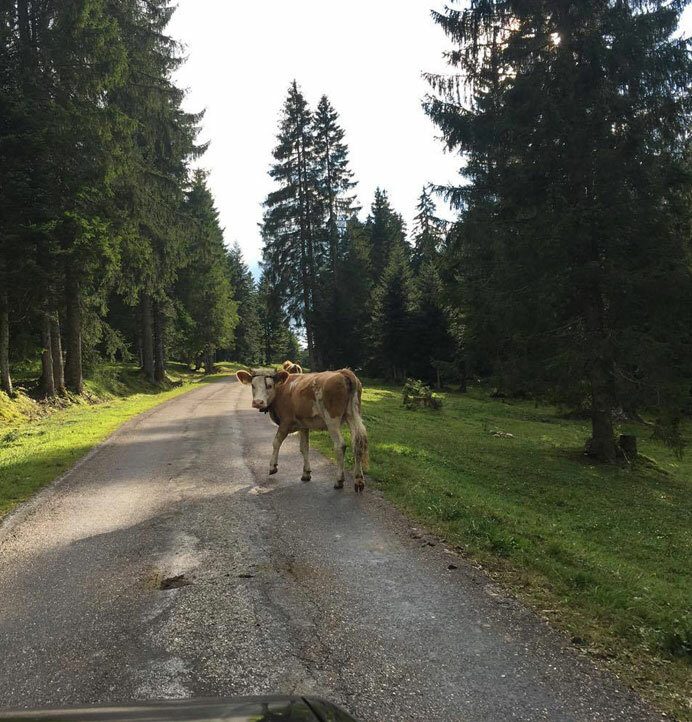 Switzerland is where I normally head for the the big mountain passes that roll for miles, but on this occasion I had something different in mind. The spot consisted of a section of road 1.5miles long, mainly straight and a steady gradient. 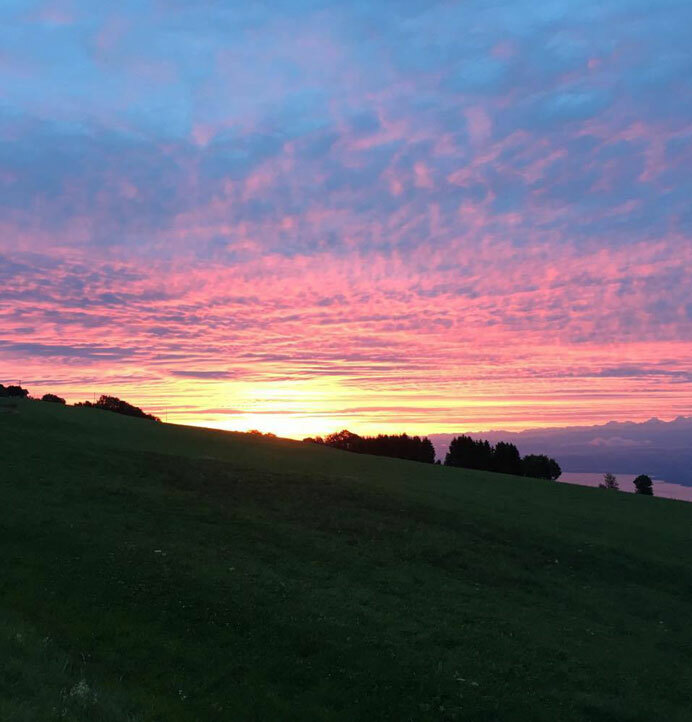 The beauty of this hill is that you hit your terminal velocity and then maintain your top speed for a sustained distance, any alterations you make in equipment show in that top speed and can be recorded with a decent level of accuracy. 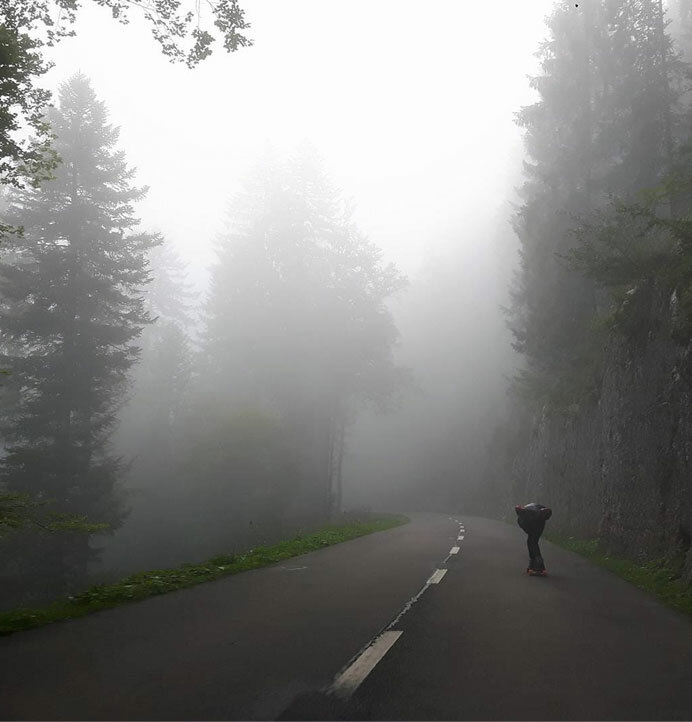 Rain greeted me when my alarm went off at 6 am and we made the call to go back to bed, wet roads were not going to help me skate consistently. Getting up a little later Damien and I started to talk about the upcoming event that we are both attending, having both been last year there was much to talk about. We made use of our time by stripping and rebuilding Damien’s luge with new angles and ride heights for his trucks, and a new bushing setup with a few custom tweaks. While not skating, it was great to spend time with someone in the same mindset who shares your goals. I think it brought the event into focus for Damien too, and all of a sudden he wanted to test his new setup and had a fresh energy about him. The rain had stopped a couple of hours ago and we decided to head out and see how dry the roads were…. Arriving at the testing hill it was still patchy wet on the tree lined Swiss ribbon of tarmac. After losing several precious hours of ride time already, I was of the mind to see what could be done regardless of the conditions. My plan was to skate from a marker to a marker. I have my feet positions marked on my board to ensure no variations, and have created a mental process to fold down into my tuck to make sure I am mindful of all the key elements. Time to get some baseline data on my gps. I stepped on the board with only one push and tightened down into my tuck. 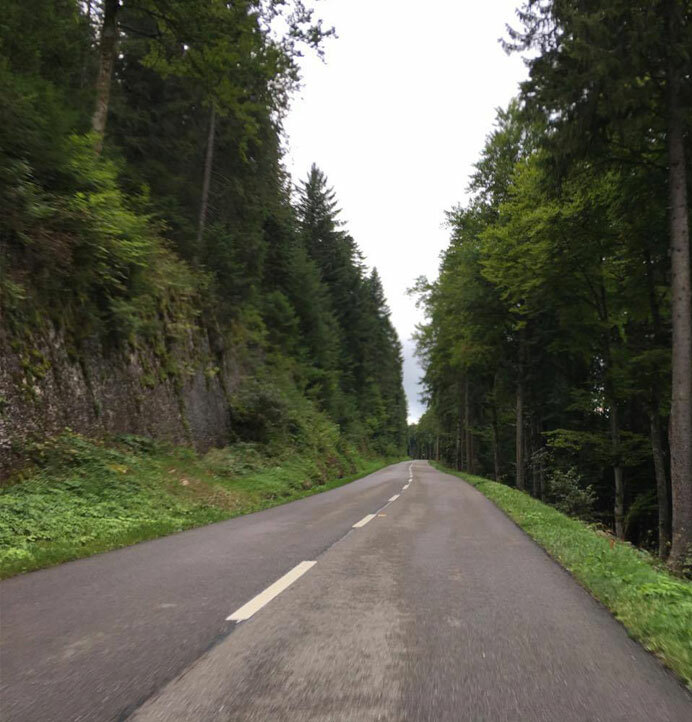 The road is not perfectly straight and has flow, requiring a decent amount of lean from your tuck in a couple of points, but has about 700 metres of dead straight at the end. I stay down until my chosen road marker pops up, and uncurl. Top speed is not my focus here, but instead accurately repeating the same section of road as precisely as possible. I skate each variation of equipment twice on the trot (providing I feel the run was not flawed) and record them with notes on a sheet I have prepared. 50.50mph is my average baseline, standard tuck and the wheels I always skate, a nice start, fast enough that I know my aero is coming into play, not so fast that I am having to focus on the road and surrounding elements too much, letting me get on with my job. I start with switching to the wheels I used for my fastest runs at last year’s record attempt and reconfirm what I already knew, if you want to obtain high speeds, contact patch matters; 52mph obtained from the wheel change. Having had 5 runs and getting some good starting data for a patchy road, we call it a day and head home. Damien takes me out to an Alpage, a small Swiss restaurant way up in the hills, basically the summer home of the people who keep the cows; they serve food in the day to supplement their income, while tending cows. Despite having spent lots of time in Switzerland before, this is a side I had never seen, and nor would I without Damien’s local knowledge. You would never know that the miles of rough, single track road, would lead to a busy and thriving place! I eat traditional Rosti with fresh cheese, made from the cow’s milk, and drink some great beer, while we talk about aero and the weather for the next few days, it’s looking sunny for tomorrow. 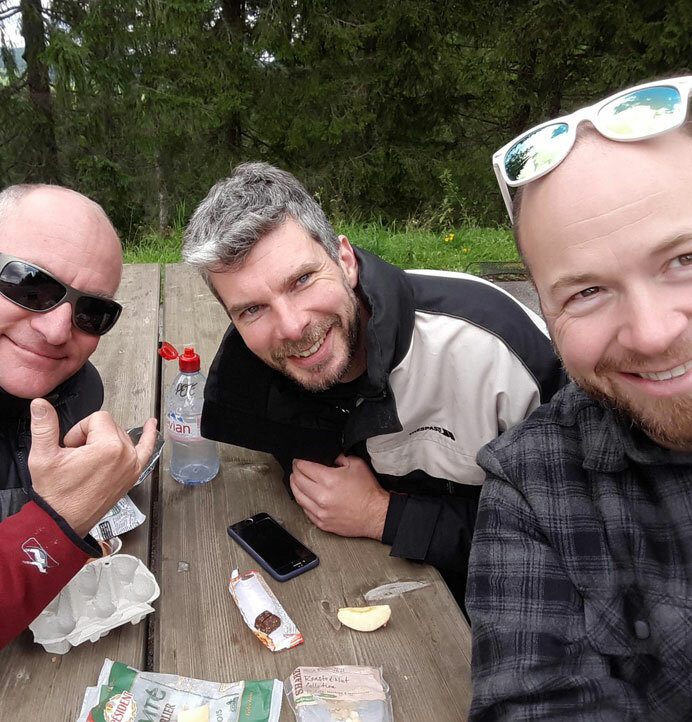 Legends of Downhill… Claude Gesta, Pete Connolly and Damian Andrey. Next morning and we are up at dawn for a huge breakfast of Erik Lumberg’s recipe of banana omelet, with an addition of nuts and maple syrup on top, proper riding food! We get to the hill and the clouds are still drifting in and out, making the sunrise cause a glow in the mountain pine trees around us, it makes me grin and remember why I love getting up in the morning for a skate! Visibility is good enough, so we crack on. We started with Damien jumping on his luge to give a test. Having not been able to ride for a couple of months due to injury, he has a huge grin on his face and the excitement of a big kid! As he pushes off the fog is rolling in and out, and cows line the road, it’s a memorable moment that sets a good tone for our day. After a couple of runs we move down the hill to the section I am using for testing. To ensure that my baseline data is relevant, I repeat the same wheels and set up as my last runs yesterday. Next I switch to some prototype wheels that have been lathed down for a smaller contact patch and there is improvement over the next 3 runs. They are a smidge faster, but not enough to smash any records; only 0.5 to 0.7 mph faster. As the sun burns off the clouds, I quickly switch back to the previous wheels to ensure conditions haven’t changed, and confirm my data is accurate. Time to try the next wheels then… Bang, 54mph, now that’s a marked improvement from wheels alone, 4mph from my starting point and 2mph from last year’s wheel choice, stoked! The results are repeatable as I switch between wheels over the coming runs, I now know what wheels I will ride in Canada. Speed suits – yes they work. I had seen the dramatic effects on top speed at the 2016 L’ulitime Decent and knew that, if I wanted to improve, a speed suit was essential. I had obtained a couple of different suits, one a suit that I knew riders used last year, to ensure that it was worth a damn. Although they work, not all suits are equal. I wanted to know that my suit worked for me. I had tested the suit twice last week at Langdon Beck, each of those runs were flawed, so I still hadn’t seen anything concrete yet for myself. 100m later a coach is driving up the hill and its wake buffets me around in my tuck, 54.64Mph, only a .20mph increase. Re-run on that one then. Clean run next, 56.83mph, that’s coming on a 3mph increase. Motivated, I take another run and try to stay mindful of everything in my tuck….58.59mph! That’s over 8mph faster than my baseline standard wheels and leathers, surpassing my most optimistic hopes. I achieved 22 runs over the day, trying different combinations and re-confirmed my speeds, hitting another two 58mph and two high 57mph runs in the speed suit, and only just making 54mph twice without it. Significant. L’Ultime Descente is 15-17th September – check out their website and facebook page for live action and results! You can read the Part Three of Pete’s mission for Top Speed: World Speed Record Attempt at L’Ultime Descente.